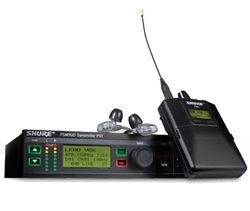 The PSM®900 Wireless Personal Monitor System from Shure offers an unprecedented combination of superb audio quality, robust RF performance, and category-leading features for the most demanding professional applications. Patent-pending CueMode allows the sound engineer to monitor different stage mixes with the touch of a button. Precision front-end RF filtering significantly reduces dropouts from RF interference, and the enhanced digital stereo encoder provides excellent stereo separation and audio clarity. Shure's PSM®900 offers unprecedented audio and RF performance for the most demanding professional applications. Precision front-end RF filtering, the same found in industry-leading UHF-R®wireless systems, significantly reduces RF interference for a cleaner, stronger RF signal, fewer dropouts, and less audible artifacts. Patent-pending CueMode allows monitoring of different stage mixes and storing of up to 20 separate channels on one bodypack for quick and easy reference. Front Panel RF mute switch for enabling or disabling RF transmission. MixMode® Technology allows the bodypack user to balance the level of two separate channels while simultaneously listening to both signals in both ears.